The ultimate guide for the budget-conscious traveller. After the runaway success of five editions, Camps Australia Wide has produced their sixth edition, with more sites, informative symbols and in full colour. This spiral bound “Mega B4 size Camps 6 with CampsSnaps” comes with a hard cover and has 400 pages. It has been revised and updated with 3,700 sites and over 2100 photos providing a visual preview of the sites before you arrive. As they say, a picture is worth a thousand words! 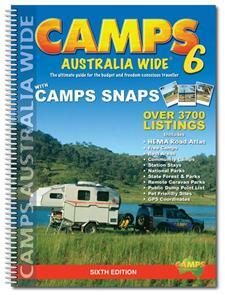 Camps 6 includes the Hema Road Atlas with the campsites positioned in their exact locations on the maps. As one person put it what a bonus. Two books in one so easy to reference. This book is not just a guide to camping spots for certain areas, but encompasses the whole of Australia, showing rest areas, free camps, station stays low-cost caravan parks, national parks, state forests, state parks and reserves. Facilities at each site are depicted by symbols, including not only the standard ones, but those applicable to motorhomes, such as big rigs, maximum stay allowed; dump points, pets allowed, fees applicable. Descriptive icons include: close to road; pleasant outlook or vista; mobile phone coverage; dry weather access and author recommended sites. All sites have a GPS co-ordinates, and site access details have been expanded. Included in this edition is a Public Dump Point list of over 400 dump point locations with addresses, as well as symbols to show suitability for cassettes, holding tanks (and whether a fee is applicable), together with access suitability for big rigs. All in all, an easy to use and comprehensive guide to rest areas and camp spots throughout Australia, a definite must have for all travellers. If you are considering purchasing a guide book, click here to see the cheapest prices we’ve found.